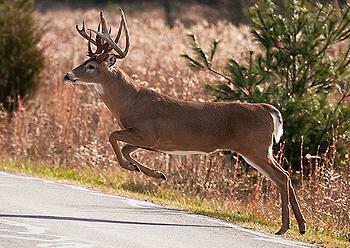 CINCINNATI, Ohio, August 21, 2011 (ENS) – A federal grand jury in Cincinnati has returned a four-count indictment charging a wildlife officer for the Ohio Department of Natural Resources, Division of Wildlife with wildlife crimes. Allan Wright, 45, of Russellville, Ohio, is charged with trafficking in and making false records for illegally harvested white-tailed deer in violation of the Lacey Act. The Lacey Act makes it a crime for a person to knowingly transport or sell wildlife in interstate commerce when the wildlife was taken or possessed in violation of state law. The Lacey Act also makes it a crime for a person to knowingly make or submit a false record, account or label for wildlife which has been transported in interstate commerce. The case was investigated by the U.S. Fish and Wildlife Service, Office of Law Enforcement. The indictment, delivered on August 17, charges that Wright knowingly sold and provided an Ohio resident hunting license to a South Carolina resident during the 2006 white-tailed deer season. According to the indictment, Wright falsely entered an Ohio address for the hunter in order to obtain a resident license. Ohio law makes it a crime to procure a hunting license by fraud, deceit, misrepresentation or any false statement and to hunt without a valid hunting license. The indictment charges that the South Carolina hunter killed three white-tailed deer using the illegal license. Wright personally “checked in” the three deer, again providing the fraudulent Ohio address. The hunter then transported the deer back to South Carolina. In a separate count, the indictment alleges that Wright, using his authority as a wildlife officer, seized white-tailed deer antlers from a hunter who had killed a deer illegally during the 2009 white-tailed deer season. The indictment alleges that, rather than dispose of the antlers through court proceedings, Wright caused the antlers to be transported to another individual in Michigan. The indictment charges that Wright then filed an official state form which falsely reported that he had personally destroyed the antlers. Two of the four counts charged in the indictment are felonies punishable by up to five years in prison and a $250,000 fine per count. The remaining two counts are misdemeanors punishable by up to one year in prison and a $100,000 fine per count.